A guide examining an efficient and AFK-able method of training melee in RuneScape - Bandits! Information and tips on maximizing your experience per hour! An in-depth guide for training melee on bandits! Welcome to my official guide on training melee at Bandits! A efficient afk-able training method for members only. The guide consists of general information, tips, recommendations and the best spots maximize your exp/h! Training at bandits is afk-able, so you can easily doing other stuff while training to decrease boredom, just remember to check your RS every few minutes. There are other routes such as the Duel Arena with a Ring of Dueling; however, it shouldn't make much of a difference if you use this guide properly. Remember to bank in Al Kharid on your way back. Once at the Shantay Pass, either buy a pass from Shantay for 5gp or bribe the guard with 200gp from your bank or inventory. It is recommended to bribe the guard for an extra inventory space for food. 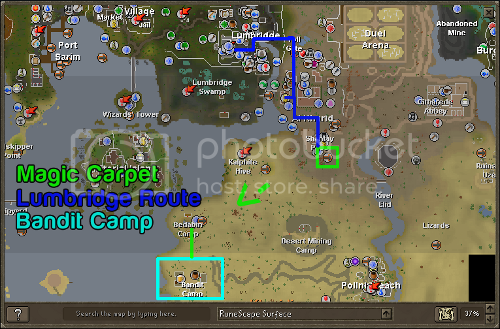 Then ride the Magic Carpet (200gp - use money pouch to keep that extra inventory space) to the Bedabin Camp and walk directly south to the Bandit Camp, not far away. Since this is a guide for meleeing bandits, I'm only given recommended levels for melee, simple as. Anything lower than this isn't recommended because you constantely Depending on your gear, you're going to want a high level defence to withstand attacks from bandits - dispite their low enough level, they can hit you often. 43 Prayer is optional, but recommended to pray protect from melee if you are in the bar or just if you run out of food and want to stay a short while longer. 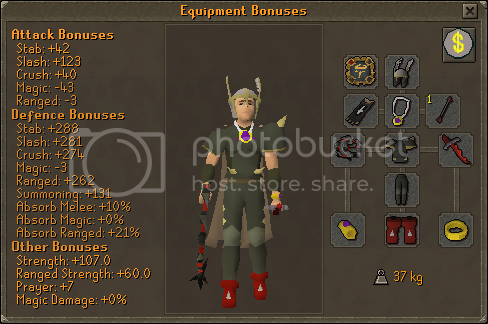 This is my basic gear, since I don't have much money anymore. I mean, we're talking about bandits here, anything will do. I may go into detail in the future, but whatever. Just one important note. If you equip a god item of Saradomin or Zamorak, the bandits are aggressive forever, at least until you remove it. If you are meleeing, it is strongly recommended that you wear a Saradomin/Zamorak arrow since that equipment slot has no importance since we're meleeing. Since Guthans (when all 4 parts of the set are equiped) heal life points, this is a great training method. Successful hits have a good chance of healing you the same number of life points as how you hit (1:1 ratio). So if you were to hit 200, you would be healed 200 life points. If you are training attack or strength, you can't use guthans to heal you because you need the full set equiped and the spear only gives defence exp. It is a good idea to use regular gear and switch to guthans when you need to be healed. However, if you are training defence, this is very efficient method of training on bandits. Note: It is not recommended to afk with guthans if you have no food remaining because you may not always hit. This is an ideal inventory, costing very little. Lumbride Teleport - Again, my banking route is usually just Lumbridge, doesn't bother me. If you wish, you can equip a Ring of Dueling (Duel Arena) and have an extra inventory space. Also can be used as an emergency teleport if you are afking and your life points get very low. Super Defence (4) Potions - Recommended; very helpful for training longer and saves more food than the used inventory spaces because of the huge defence bonus. 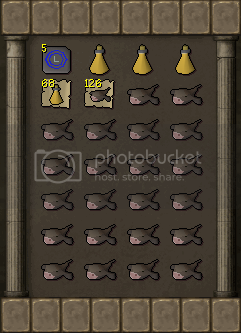 Monkfish - Any food is fine if you are using the noted items method, but monkfish are cheap and heal a lot of life points. Noted Items & Coins in Pouch - This will be explained further in the guide (Training Tips -> Noted Items) - coins are required to use these items. Bringing these are strongly advised to avoid banking. Any amount of food/pots can be brought in noted format, the more, the longer you stay! Aggressive? : Only when attacking other Bandits, or wearing Zamorakian/Saradomin items. A list of Bandit drops can be found here, nothing great though. Detailed information can also be found on that page. 1) My favourite spot because there are three level 57 bandits inside, so you'll never be left idle! 2) This house consists of two level 57 bandits. 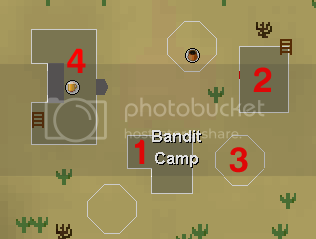 If the door/entrance is open, the bandits outside will often come in and attack you. 3) Again, there are two level 57 bandits! Not as good as number 2 because the bandits outside are usually closes to the house, not the tent. Here you will find some basic bandit training tips, more detailed information on the better tips are put under their own title (7.1 etc). When training, it is a good idea to stand near the entrance. The bandits inside will still attack you and the bandits outside will clearly see you from a much greater distance. Use Guthans (information above) for healing instead of wasting food; simply switch over when you need some more life points. Don't share a spot with someone else! Bandits can be very crowded, just keep hopping until you find a free spot. Remember to keep your life points high and keep potted up to make sure you get maximum exp and don't die! If someone takes your spot, don't spend half an hour arguing with the douches, just hop or move if they won't. All you're doing is wasting valuable training time! If you have kept hopping and still can't find a spot, try standing out in the middle near the general store, not as good exp, but it still works if you're stuck! Really want to get the highest exp/h you can? Bring along a full super set (and in noted format too!). Remember to do this fast and don't let anyone take your spot while getting your food and pots back, it's happened to me before! As I've already mentioned, the bar to the west is home to the level 74 bandits, opposed to the level 54s in the other spots. This is a dangerous spot so afk'ing for long periods of time is not advised, especially if you have low defence/bad equipment. On the other hand, this is a great way to get fast exp. Praying protect from melee ensures you get hit nothing though, so if you REALLY want fast exp and have the cash, just bring an inventory of prayer potions (but they are costly!) and pray away. You can also use the general store/noted items method with prayer potions too. Ah yes. AFKing while training on RuneScape, always a good thing for a person who can't stand the boredom of grinding like me! However, even if you are in combat, you will get logged into the lobby after five minutes without clicking on your RS screen or whatever, so remember to check back and click, pot up or eat. Now - what to do while AFKing? There are many things you could do, just some of them are watching a movie/TV series, chat in IRC, go on Facebook, whatever! You can ever chat in our Clan Chat or with a friend on RuneScape; that way, you can even make sure you have you don't die. Me - For writing this guide! RS Wiki - Extra information on bandits, guthans and some nice images. 18/12/2011 - Fixed align problems. Updated guide with more information. Ah yes, slayer may be more fun, but then you get to that task that you just hate! And with Bandits, all you need to do is stay in the same spot afk'ing for however long! You know I meant guthans, since I wrote a few paragraphs on it earlier in the guide. xD But thanks for pointing that out, just a typo. Nice, thanks for posting this, it's realy usefull. This is another guide that I think is worthy of being promoted to an article. I'm just posting this as forewarning if you want to change anything or update it. You think so? Good to know someone thinks it's a decent enough guide. It's not 100% finished by way of throwing in a few more armour images, but I don't think I'll bother, so it's fine.I thought all those articles were Skyrim based only though? Made quite a few edits to the format to convert it to an article, which can be viewed here.